This Round 9 Basket Willow Triangle Base Display is the perfect way to show off up to nine different products on one fixture. Fill with a variety of candy and toys for the kids, tasty and healthy fruits and vegetables, soaps and loofah's plus more. Place small hardware items in the baskets for easy organization. 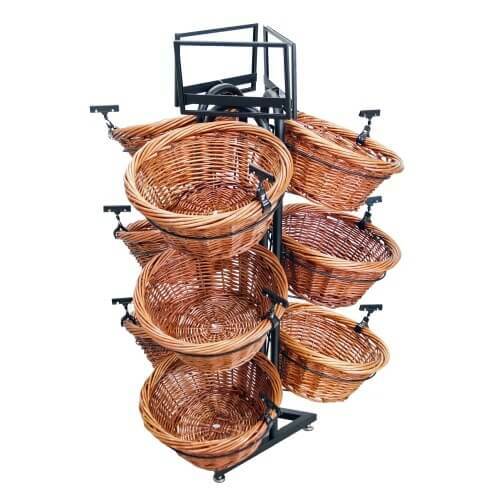 Use this basket display in a produce department for small fruits and vegetables. No matter where it is placed, the beautiful woven baskets will add an element of classic beauty and gain a little extra attention towards your materials. Cross-merchandise and get creative when you add your merchandise to this stylish retail floor fixture. 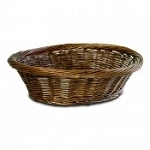 If you are looking for something a little different, we also offer this stand with two-tone colored baskets. Order your wooden store display and rack by clicking on "add to cart" now! You will not regret adding this to your showcasing areas.